For the future national security leaders being educated at Batten, it makes perfect sense to challenge—and, perhaps, discard—some of the practices put in place after the post-9/11 terrorist attacks. A recent forum put on by Batten’s National Security Policy Center (NSPC), titled “The Future of Counterterrorism,” brought scholars and policy makers to grounds to undertake this reassessment. At “The Future of Counterterrorism” conference, left to right: Matt Olson, moderator, standing; Eliza Goiter; J. Patrick Rowan; Chris Costa; Eliza Massimino, gesturing; and David Cohen. “The notion behind the event was that we created a legal and policy infrastructure for dealing with terrorism immediately post-9/11, but things have changed and policies and strategies that we have come to think of as second-nature may no longer be suitable,” said NSPC director Philip Potter, on the eve of the Center’s one-year anniversary. Giving a hard review of status-quo practices—indeed, calling into question much of the established, default ways of protecting America—became part of the NSPC’s mission in its first year, which included public and private conferences and conversations with dozens of national security professionals in the United States and abroad. As David Cohen, former deputy director of the CIA, said at the counterterrorism forum, “We want to be able to adopt new ways of addressing the terrorist thereat, including offensive cyber-operations, for instance, and other potential ways to go out after” terrorists. “Congress, frankly, ought to stand up and take the hard vote here to authorize the fight against international terrorism. The public is better served to have legislation” come from its elected representatives, Cohen said. 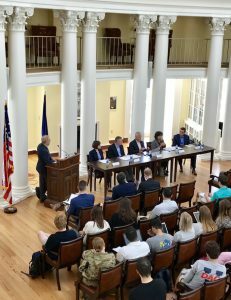 The counterterrorism forum was part of a larger Batten conference that, with assistance from UVA Law School participants, included numerous private sessions with more than 20 current and former administration officials. One panelist turned theological in her remarks, demonstrating that grappling with future national security issues might require a broad perspective. “Many great people are trying to make the system of military commisons work, (but) I think that there was sort of an original sin of military commissions” being used to bring terrorist suspects to trial, said Elisa Massimino of Harvard, referring to the tribunals, authorized by presidential order, to prosecute prisoners still being held in the U.S. Guantanamo Bay military base in Cuba. “I think there was sort of an original sin in (the) military commissions” being used to bring terrorist suspects to trial, said Elisa Massimino of Harvard, referring to the tribunals, authorized by presidential order, to prosecute prisoners still being held in the U.S. Guantanamo Bay military base in Cuba. These are “people who, sadly, we tortured—and there are lots of other problems with the way we treated them—but we have a pretty good sense that these are the people who are responsible for the most terrible mass murder in our history,” said Massimino, former president of Human Rights First and now a senior fellow at Harvard’s Carr Center for Human Rights Policy. “What happens if (military) convictions are not sustainable by a regular (civilian) court?,” she asked. “Are we going to let (the defendants) free, which most people assume is never going to happen? “Would the United States dare become one of the few nations in the world that holds defendants “in custody for the rest of their lives” even after they are found not guilty? 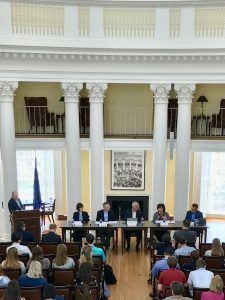 Massimino identified just one of a host of serious issues confronted throughout the year by Batten students, who heard from guests ranging from experts in European security matters to military intelligence officials. Among the topics at more than a dozen programs over the course of the last year were “Terrorism Prevention: New Approaches to Counterterrorism Since the Rise of ISIS,” a discussion with federal prosecutors and a former FBI senior advisor; and “The Future of Security Cooperation Between the U.S. and EU,” in partnership with Germany’s Konrad-Adenauer-Stiftung, a public policy organization. In addition, the NSPC has trained intelligence analysts in a series of workshops and took students in Batten’s National Security Policy Cohort to D.C. to speak with officials at the Pentagon. About 15 graduate students make up the National Security Policy Cohort, a group of national security professionals from the U.S. and other countries. These students take dedicated classes, engage with the Center, and attend workshops and seminars. Many of the classes and events are open to all Batten students, as well as UVA students in general. The counterterrorism forum was one such public program; another was the April “Batten Hour” presentation ”Ethics of Espionage: the Value of Secrecy in a Democracy” by UVA graduate and former CIA senior official Eric Allison. “We have relied on Congress, on inspectors general, on the media to supplement the formal, legal processes of accountability within government,” Allison said. “Even though those mechanisms exist, there is still the broader, public marketplace of ideas and opinions. Allison’s comments underscored Batten’s commitment to a national security policy training that gives students practical exposure to the interactions between intelligence officials and the publicly elected officials who have oversight responsibility. The National Security Policy Center prepares Batten graduates for the real world, where they may be asked to take on significant responsibilities early in their careers. “Our students need to be prepared to deal with policymaking as it exists,” Potter said, “but we also want to equip them to do better by providing them the knowledge to make a contribution to these conversations, as opposed to going around as a cog in a machine. “By virtue of who we are and where we are as a university, we’re well positioned to do that.” Batten prepares its graduates to assume authority, Potter said. “Our students who decide to serve in government find that the upward mobility can be pretty substantial.” Staffing levels in government positions “tend to lead to additional responsibilities for talented individuals quite quickly,” he said. “The Future of Counterterrorism” agenda is here; a flyer promoting the public forum is here. The video of the public form is here.